Exciting and new system of building staircase for access to the shoreline from high bluff developed by: About Nature, LLC. This article includes additional information and highlights the most important design and installation features for our proposals. 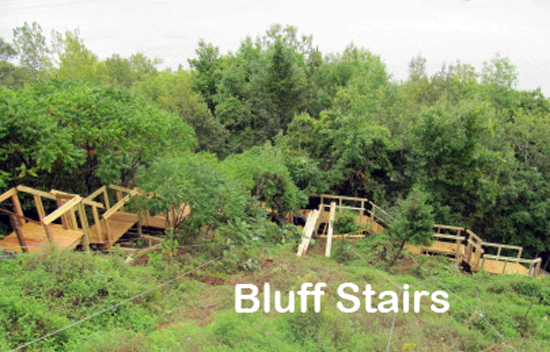 It its imperative that this information is presented to permit issuing officials so they can see how our new system is designed to work with the changing bluff conditions in a manner that actually helps to control erosion by stabilizing the areas under the staircase. All metal system components that are within contact of the soil are high tensile strength galvanized steel grade to prevent corrosion and would provide indefinite life. The system is designed to work with changing soil conditions. 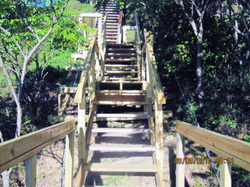 The high tension (aircraft) cabling and adjustable connectors allow for future adjustments of the individual staircase components, to keep it straight, level and safe, as the earth conditions change through the seasons and over the years. Installation of this system does not require heavy equipment. Excavation, drilling or any ground disturbance are not required. Soil, shrubs, trees and all existing features are not disturbed during installation. The entire staircase system would be hand-crafted and constructed in place on top of the existing soil, with connectors to the adjustable tension cable system. The design of our staircase system would be customized to every landscape with the provisions for making future adjustments for changing conditions. The About Nature bluff staircase systems allow land owners to appreciate the beauty of their property as it is, while creating access to areas previously deemed inaccessible. 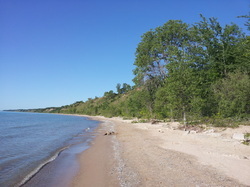 This would be accomplished at a fraction of the cost of conventional methods and construction systems and will allow for indefinite life while helping to preserve the existing bluff environment. We have received enthusiastic reviews from our customers and have also received praise from local and various government officials for our projects. We will gladly provide assistance and additional details for our clients, as needed, in order to obtain approval for installation from local authorities. Difficult natural environments, such as wetlands, steep bluffs, dense terrain, etc. are often the most desirable and most expensive places to live. These valuable locations unveil the secrets and beauty of nature. 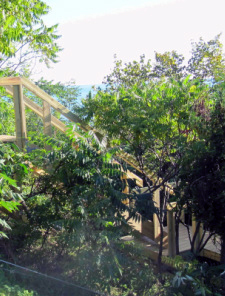 By working with the natural terrain we custom design bluff and hillside, modular stairway systems to satisfy each land owners specific needs and requests. Modular design and construction allow integrating stairs, stairways, platforms, tables and even seating areas to create the unique oasis each owner deserves to fully enjoy all that nature offers. At About Nature, Co. we have developed an innovative modular stairway system which allows our clients to appreciate and enjoy the beauty and serenity of these fragile environments without affecting their integrity and stability. Blanketing Method – used on steep slopes where erosion and shifting occurs. Custom designed modular platforms, modular stairs and modular scenic decks. Suspended networks of steel ropes and chains which are anchored innovatively, therefore protecting sensitive areas. Eliminating need for traditional and damaging construction methods. Extended life of access structures and slopes. 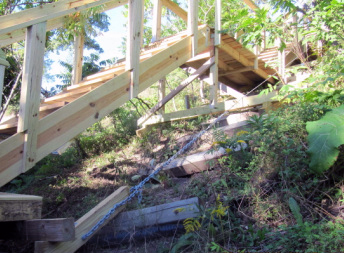 Our bluff stairways use anchors inspired by the US Army Corps of Engineers to create a "floating" and modular construction. This design style minimizes the damaging effects of erosion visible in more traditional construction methods and allows a great range of correction when shifting occurs in the terrain. Sections can be added, changed or removed because they are modular. Fraction of the cost of conventional methods. Built with the natural beauty in mind, not destroying it.